Deathurge has the ability to become intangible at will, and draw forth from his non-reflective ebony body a variety of simple objects and weaponry such as swords, spears, axes, bows, and arrows. These weapons, also non-reflective black, appear to be made of the same unknown substance as Deathurge's body. He can fly at great speeds by riding upon an ebony spear or using skis created from his body. These weapons do not inflict physical wounds, but are imbued with life-annihilating properties that can kill even powerful superhuman entities. However, they prove to be effectively useless against spirits and demons . . . . But pause for a moment. Are there limits to his omnipotence? He must find the time to shop, because he wears gloves, boots, and a cape. 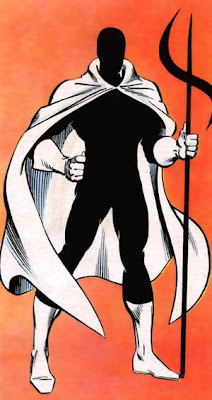 And his choice of color for his clothing is white, which must certainly get dirty when fighting superheros. Does he have a personal shopper? But the real issue: Why not pants? That's sort of embarrassing, isn't it, especially when your super moniker includes the word "urge" in it? Anyway . . . .